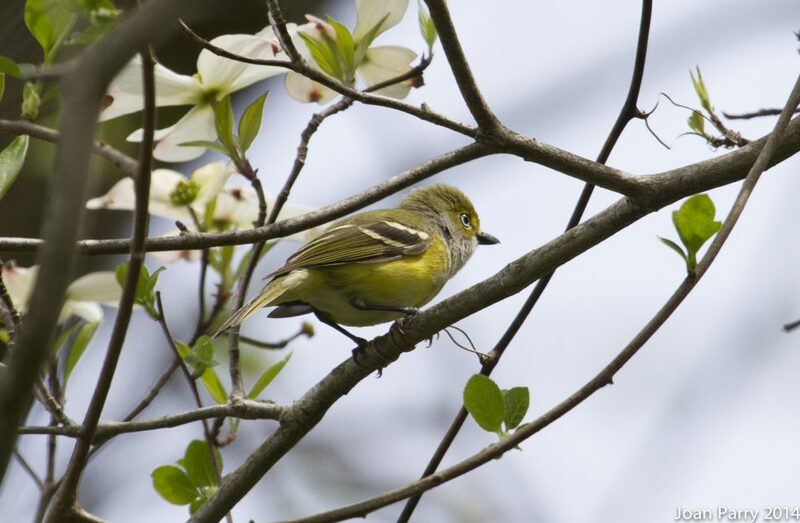 In addition to using native plants and removing invasive plants, here are some ways to make your property more bird-friendly. Note: The list is not ordered by importance. 1. Wildlife water feature – Birds and other wildlife need a ready source of fresh water to survive, so small ponds, bird baths, water drips, etc. improve your habitat. These water sources need to be kept clean and fresh, especially bird baths. Also locate bird baths out of reach of predators such as cats. 2. Cats indoors at all times or in outdoor enclosure – Outdoor cats kill millions of birds each year and are a special threat to fledglings and ground-nesting birds. Fledglings (birds who have just left the nest) spend some time on the ground unable to fly and are very vulnerable to cat predation. 3. Beneficial insect nesting habitat – Rock piles, bundles of stems and branches, and mason bee boxes all help insects thrive on your property contributing to the natural web of life and helping provide birds the vital food they need. 4. Snags or nurse logs – A snag is part of a dead or dying tree left standing and a nurse log is a fallen tree left lying on the ground. A snag can provide nesting habitat and insects for birds. A nurse log can provide a place for new plants to germinate and insects for birds. CAUTION: Only leave snags where they won’t present safety hazards when they eventually fall. 5. Pollinator Garden – Hummingbirds, native bees and wasps, and other native pollinators are threatened by loss of habitat and pesticides. You can help them by adding native plants that bloom at different times during the growing season to give them the nectar and pollen they need as food throughout the growing season. 6. Prevention of bird window collisions – According to the American Bird Conservancy, “Millions of birds die every year flying into windows because they can’t tell reflections from trees, plants and sky. Most of those windows are on houses.” They have recommendations to make windows more visible on their website. In addition, you should keep bird feeders either within 3 feet of windows (too close to be fatal) or more than 20 feet away. Also use fiberglass screens on windows where possible. 7. Using leaves as mulch and fertilizer – Leaves, when they fall from your trees and other plants, are nature’s way of fertilizing and mulching the vegetation in your yard. Mature habitats can be self sustaining if leaves are left where they fall. Worms and many insect larvae such as fire flies rely on leaf litter for their habitat and food and, in turn, feed the birds. If you don’t have enough mature trees to provide the leaves, you may be able to obtain a load of leaves for free during city leaf collection. If the leaves are too coarse, just run a mulching mower over them a few times to grind them up. 8. Reduction of lawn areas – Lawns with the typical nonnative grasses such as fescue can require fertilizers, herbicides, insecticides, and frequent mowing, all of which are detrimental to wildlife and the environment. Grass lawns also produce few insects for birds. Creating natural areas with native plants and leaf mulch is a much better and lower maintenance alternative. 9. Minimal use of non-organic fertilizer – Healthy garden soil with leaf mulch needs little or no fertilizing. But if you have to use fertilizers, organic fertilizers are much preferable. In contrast to non-organics, they release nutrients slowly preventing runoff of chemicals that damage streams and lakes, and they build the soil and nourish micro-organisms that are vital to soil health. painful. Birds of prey such as hawks and owls will catch poisoned rodents while they are still moving around and then can suffer the same fate of slowly bleeding to death. 11. Replacing gas-powered equipment with electric – Gas powered lawn mowers, weed eaters, and leaf blowers contribute to air pollution and cause noise pollution. Battery-powered or corded electric alternatives are better for the environment. As you reduce lawn area and use leaves as mulch, the need for lawn mowers and weed eaters will be reduced and in some cases completely eliminated.